Aşağıdaki resimde istenen yeri tarif ediniz. It is about a ten minute walk. First go straight ahead. And go past the castle. And turn right at the traffic lights. After go straight ahead. And take the third turning on the left. After go past the Library. The you will see cinema. It is next to the cinema. It is about ten minutes walk. First go straight ahead. And Take the second turning on the left. And then go past the Car Park. And Cross the bridge. And turn right at the traffic Lights. After Go straight ahead. 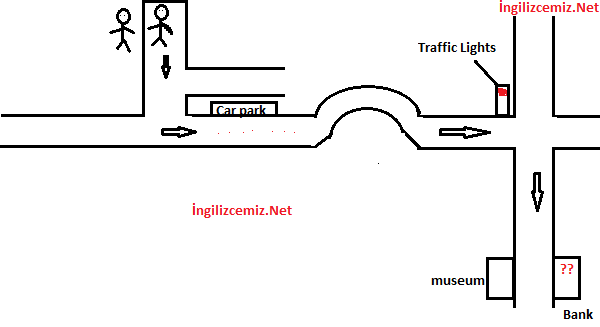 It is opposite the museum.